Hello to one of the most influential couples in Hollywood. You two have created a legacy that, try as they may, gossip tabloids cannot break up. Your family has become the idealized portrait of a post-racial America. You've collected children like stamps in a passport, and no doubt the spike in interracial adoption can be credited in some part to your pioneering rainbow coalition. New data shows that some 40 percent of American adoptions involved kids who are a different race from their adopting parents. I especially have to credit you two for mainstreaming the adoption of black children, with the welcoming of your beautiful and bubbly daughter Zahara to your eclectic family. 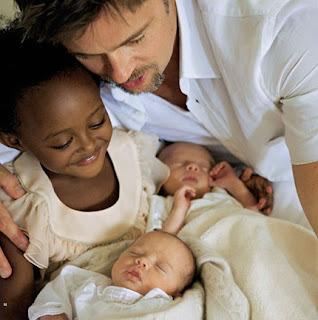 After Zahara was added to the Jolie-Pitt brood, celebrities like Madonna, Sandra Bullock, and most recently Law & Order: SVU star Mariska Hargitay, have all added a little brown face to their family. The trend is a little jarring, because it seems exactly that -- a trend. Just like Puggles or the Birkin bag, black babies seem to be the hottest (and likely, most self-righteous) accessory in Hollywood right now. It says "I support Obama and a post-racial America!" But honestly that's not what I think you two set out to do, especially considering the vastly diverse (and happy) herd of babes you now command: two tots hailing from Asia, three cherubic blonde babies, and one lone brown beauty. One. Which brings me to the reason I am writing you -- I think you should adopt another black baby. nice post...totally agree with you!